Florida’s Panhandle is littered with evidence that Hurricane Michael is one of the most powerful storms ever to hit the mainland United States. Roofs and awnings are peeled from buildings, pieces of homes are scattered amid snapped trees and downed power lines, chunks of beaches are washed away. Michael thrashed Georgia as a hurricane and eventually weakened to a tropical storm early Thursday as it moved toward the Carolinas, soaking areas that got swamped last month by Hurricane Florence. Hurricane history: first Category 4 hurricane to make landfall in Florida’s Panhandle since record-keeping began in 1851. Top winds: 155 mph (249.4 kph), strong enough to completely destroy homes and cause weeks-long power outages. High water: storm surge of from 6 feet up to 14 feet forecast for Florida’s Panhandle and Big Bend. Storm riders: Roughly 375,000 people in Florida warned to evacuate; many refused. Search and rescue teams are looking to help survivors. Power outages: More than 780,000 customers in Georgia, Florida, Alabama and South Carolina without power. Food and water: 1.5 million ready-to-eat meals, 1 million gallons of water and 40,000 10-pound bags of ice ready for distribution. The human cost: Trees crashing through homes killed a man in Gadsen County, Florida, and an 11-year-old girl in Seminole County, Georgia. Hurricane Michael isn’t alone. The National Hurricane Center says Hurricane Leslie and Tropical Storm Nadine are no threat to land over the open Atlantic Ocean, but Tropical Storm Sergio in the Pacific is blowing toward the Baja California Peninsula on a path across Mexico to the southern U.S. Plains and the Ozarks by the weekend. The Gulf of Mexico gave Michael exactly what it needed to bulk up into a monster: The water was 4 to 5 degrees F. (2.2 to 2.8 degrees C.) warmer than normal, and high-atmosphere winds that can disrupt a hurricane were quiet. 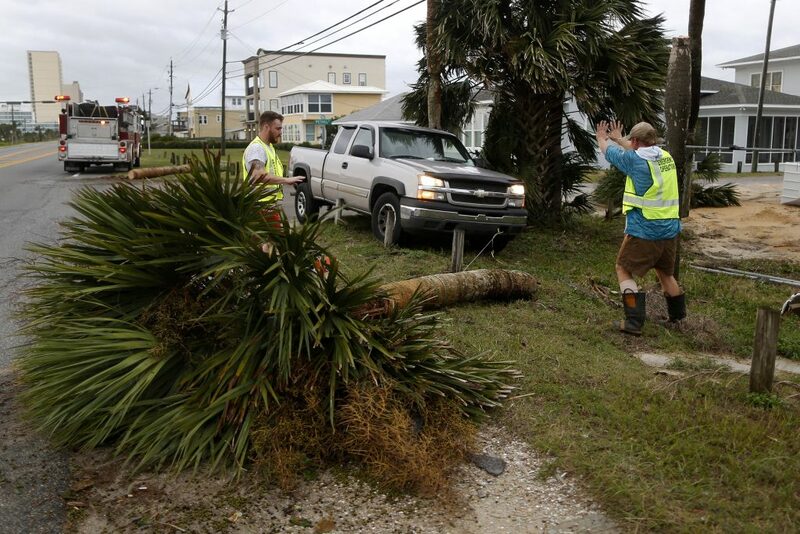 Michael’s wind speed increased by 72 percent in less than 33 hours. Meteorologists use central pressure readings to gauge a hurricane’s strength — the lower the pressure, the stronger the storm. Michael was more intense at landfall than hurricanes Andrew, Katrina and Maria. Only the 1935 Labor Day hurricane in the Florida Keys and Hurricane Camille in 1969 were stronger. Michael is shaking up the upcoming election in the battleground state of Florida. The hurricane has given national exposure to Republican Gov. Rick Scott, who is trying to unseat Democratic Sen. Bill Nelson, and Tallahassee Mayor Andrew Gillum, the Democrat running against Republican Ron DeSantis. The publicity could backfire if recovery is delayed ahead of Election Day. President Donald Trump has endorsed Scott and DeSantis. A month after Hurricane Florence’s epic deluge, South Carolina officials are more concerned about tornadoes than flooding from Michael. 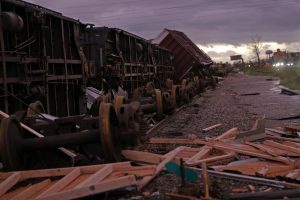 The National Weather Service issued multiple tornado warnings in Georgia as Hurricane Michael pushed through the state, and local media report three of them may have touched down. Many flights were canceled in the hurricane zone, and Amtrak changed some train schedules to protect passengers and employees. Silver Star trains from New York to Miami were only running from Miami to Jacksonville. The Palmetto between New York and Savannah, Georgia, is only running between New York and Washington beginning Thursday.